Fundraiser Photo Booth with the YMCA. We love helping organizations out with their fundraising and awareness campaigns. For the 3rd year running we are proud to work with the Moody YMCA in Dallas on their “Day of Giving”. Ask us about our ideas for your fundraising events. Instagram frame made for a fundraising event. YMCA members using our handmade props with the GIF Booth. 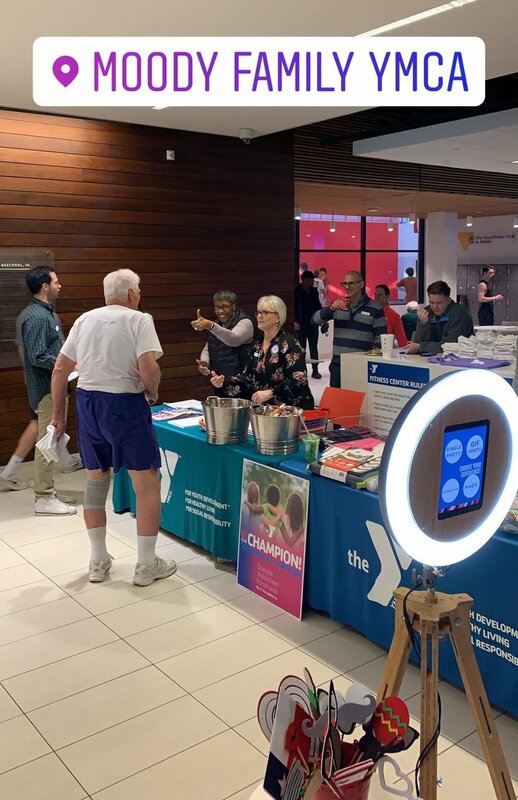 The Photo frame has the clients logo, YMCA, and their hashtag for the event. All of this is customizable when you book our services. Groups having fun with our GIF Photo Booth. It creates GIFs and Boomerangs, it also offers simple single shots, and offers live props and green screen. We offer Social Media Booths, also know as GIF Booths for rent in Dallas area. Kids love the GIF Booth, they take to it right away with its easy touch screen operation and instant feedback and gratification.